Marcus Annaeus Lucanus was a Roman poet and statesman who is usually known by the shortened version of his name, which is Lucan. He only lived into his mid-twenties but, in this short time, he established himself as one of Rome’s finest poets of the Imperial Latin period. He is best known for the epic, multi-part Pharsalia which told the tale of the tragic civil war waged between Caesar and Pompey, a conflict which included Caesar’s troops crossing the River Rubicon. 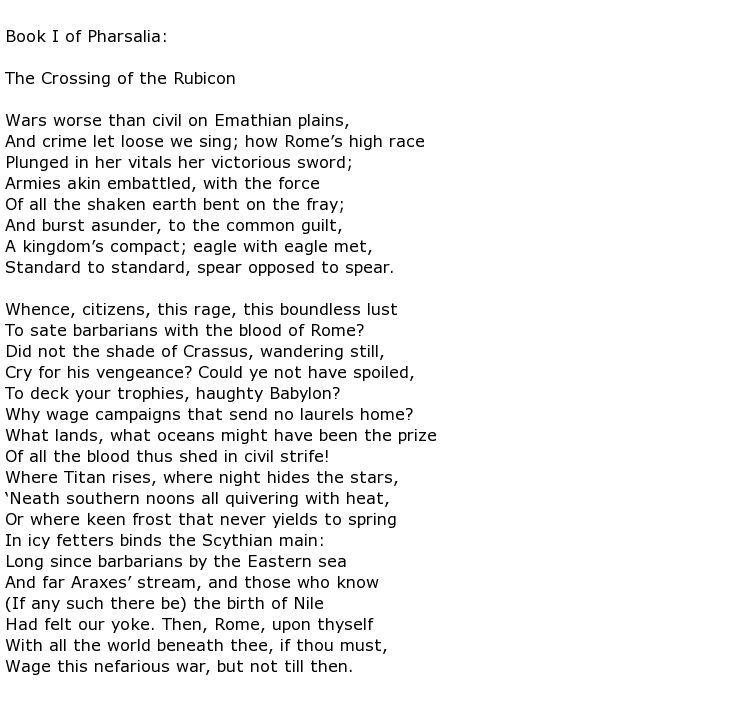 The modern day saying “crossing the rubicon” is based on this event. He was born on the 3rd November 39 AD in Corduba, a settlement in Hispania Baetica. This place is now known as the Andalusian town of Córdoba. He was born into a wealthy family, his grandfather being the famous writer Seneca the Elder. He had private philosophical tutoring from his uncle, Seneca the Younger, and he also studied rhetoric in Athens. Lucan married Polla Argentaria and it is believed that she had some input into Pharsalia. He soon found himself accepted into the Emperor Nero’s inner circle and was awarded a “quaestorship” role in public finance which was very unusual for such a young man. He was also made an augur, another prestigious title, but he appeared to see writing as his future career, as opposed to politics or public office. The first three books of Pharsalia were soon in circulation. 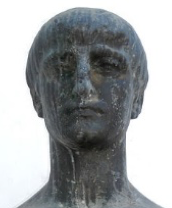 He won a prize for a poem praising Nero, presented at the Neronian games of 60 AD. It is unclear what went wrong initially but, at some point, he fell out of favour with the emperor. It may have been that Nero thought Lucan too clever for one so young and he tried to stunt his progress by forbidding the publication of any more poetry. This did not stop him writing though. One account suggests that it was the tone of Lucan’s writing, especially in a piece called De Incendio Urbis (On the Burning of the City), where he appeared to insult Nero for his passive role during the devastating burning of Rome. This ongoing feud would prove to be Lucan’s undoing though as he was accused of treason having joined a conspiracy in the year 65 AD against the emperor, led by Gaius Calpurnius Piso. As a mark of his status he was not tried and executed but was obliged to commit suicide, the traditional method being the slitting of the wrists leading to death by bleeding. Even as he lay dying he quoted some lines from one of his earlier poems, describing the death of a soldier in similar circumstances, and these proved to be his last words. Before carrying out this act he had tried to incriminate his own mother in the conspiracy but this failed to win him a pardon. It is generally believed that Lucan’s epic work, also known as the Bellum Civile, was actually incomplete because his story ends with Julius Caesar in Egypt and this was not where the war ended. The language that he uses in the piece has led some to believe that he was a Republican at heart, and thus at odds with Imperial Rome. He certainly indulged himself in gory descriptions of the conflict, especially the murder of Pompey. His talent as a writer is likely to have enraged Nero, who felt that his own poetry was overshadowed by these efforts of a much younger man. Marcus Annaeus Lucanus died by his own hand on the 30th April 65 AD, aged 25. He left behind a literary legacy that still has value today and which will continue to inspire and intrigue literary scholars wherever the work of the Ancient Romans is studied.